I apologise for being MIA again but I was spending last weekend working on my next blog hops featuring the June SOTM set and the Jubilee paper pack. After scrapbooking I needed to get back to my cardmaking. 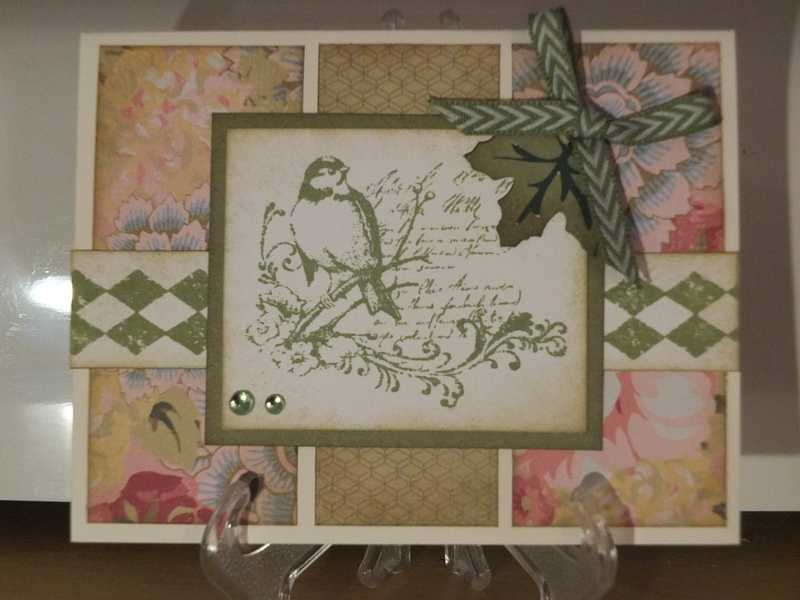 So today I have made some cards using the gorgeous stamp set Fabulously You ((C1533). This set is so versatile and I have tried to do three different versions to demonstrate this. This card has been made using the basic pattern from Make It From Your Heart Volume 2 page 46. I have stamped the main image using Olive ink onto White Daisy cardstock and then distressed the image with Cashmere ink. I have done the same with the diamond patterned stamp on the band. The main image has been matted with Olive cardstock. I had a leaf left over from the Timberline layout and it fitted beautifully with the Olive ink and cardstock. The card was completed with a bow made with the Topiary mini chevron ribbon and a couple of green epoxy bubbles. The card base I have used is Colonial White despite using White Daisy cardstock for stamping the images. But because I have distressed the White Daisy cardstock with Cashmere ink it has given it an aged vintagey look. This card has been made using the beautiful blue striped paper from the Ariana paper pack and the zip strip from the paper. The image of the cardinal has been stamped using Outdoor Denim on a base card measuring 2 1/2 x 2 1/2 inches and then stamped another three times on scrap White Daisy cardstock. I have cut out three flowers from one of the images, then the two top images from the second image and finally the top flower out of the final image. These have been layered on the original image using the Tombow adhesive – I have not used foam tape as I did not want too much height on the image. I have used the light Indian Corn Blue marker to colour the petals and a Buttercup marker for the centre. I then placed sparkles in the middle and just touched them with the Buttercup marker. The image was then matted onto Outdoor Denim cardstock and placed on the card base. 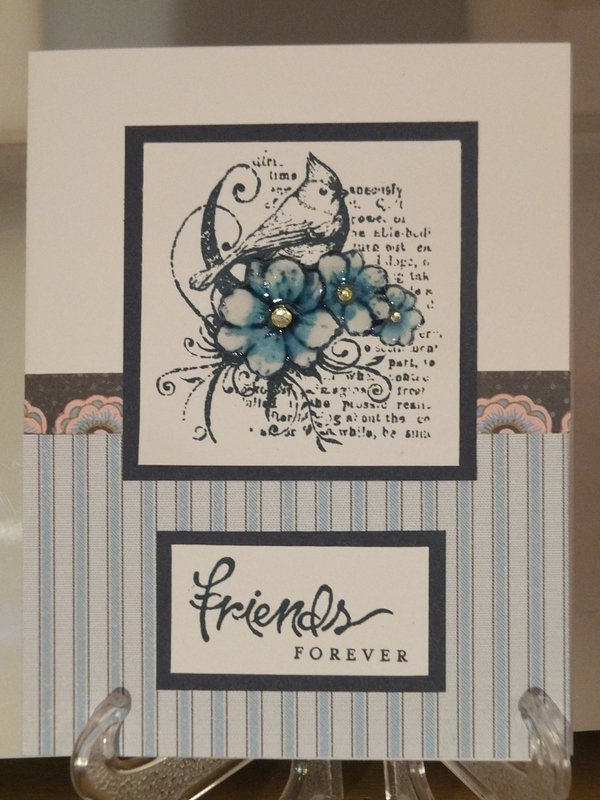 I have stamped the sentiment from the Fabulous You stamp set onto White Daisy cardstock and then matted it with Outdoor Denim cardstock. I have kept this card deliberately two-toned. I finally got the Stripe embossing folder and I love the fact that it has a split in the centre and I can partially emboss the cardstock. Here I have left 2 inches un-embossed and then matted the White Daisy cardstock onto Outdoor Denim cardstock. The band has been stamped with Outdoor Denim using the diamond stamp from the Fabulous You stamp set and then matted with Outdoor Denim and placed just above the edge of the embossing. The bird image has been stamped with Outdoor Denim ink on White Daisy cardstock and matted with Outdoor Denim cardstock. 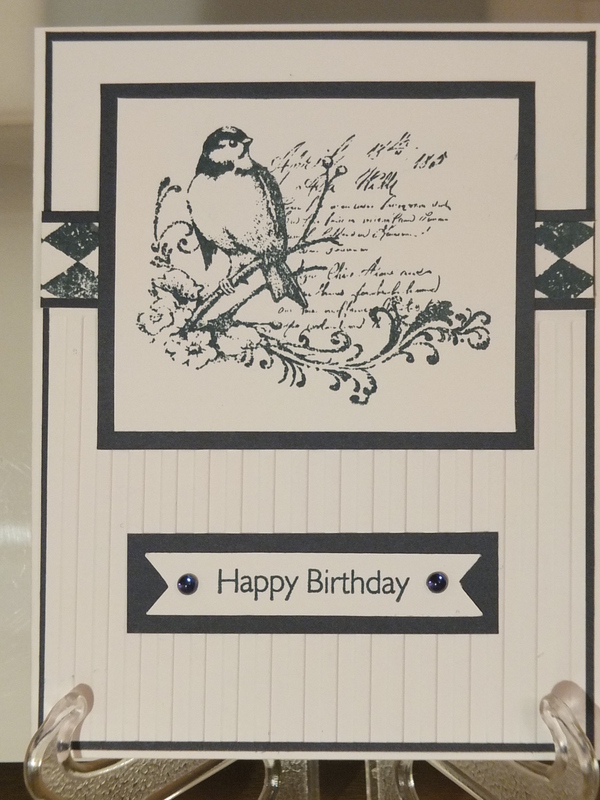 The Happy Birthday from the Holiday Tags stamp set was stamp on a banner that I had cut using my Cricut machine using the Art Philosophy cartridge. I then matted it with some Outdoor Denim cardstock and placed on the card. I finished this off with some blue epoxy bubbles.